How do I Make Noodles With a Light Butter Sauce? Barilla’s traditional pasta has 200 calories per serving. 3 How do I Make Noodles With a Light Butter Sauce? Barilla is an Italian food company that makes a variety of pastas from durum wheat. With the offering of such an assortment of pasta to choose from, you will find varying calorie amounts per the standard 2-ounce serving. Barilla's "Classic Blue Box" pasta comes in 30 different shapes and sizes using semolina. Semolina is produced from durum wheat when milled properly and gives the pasta the right al dente texture and consistency. All "Classic Blue Box" pasta are 200 calories per serving. 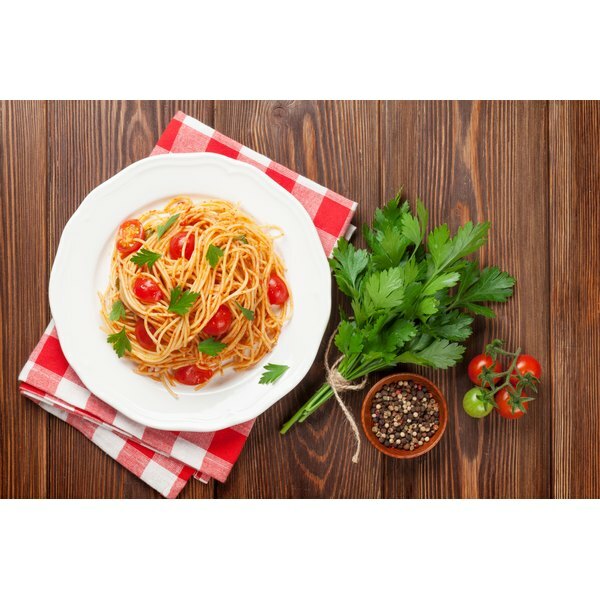 The majority of calories come from the pasta's carbohydrate content, accounting for 168 calories per serving. Fat makes up nine calories while protein accounts for 28 calories per serving. Barilla "Plus" was developed so you could enjoy pasta with additional nutrients. "Plus" offers additional fiber, protein and omega-3 fatty acids with each serving providing 210 calories. Barilla "Whole Grain" pasta is made with 51 percent whole-wheat flour. 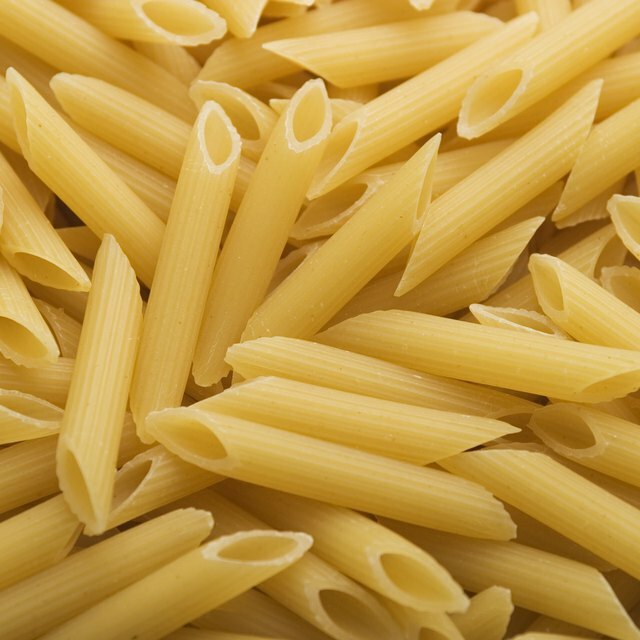 "Whole grain" pasta is 200 calories per serving and provides three times more fiber than the "Classic Blue Box" pasta. Barilla also offers "Veggie," "White Fiber" and "Gluten Free" pasta. "Veggie" provides one full serving of in-season vegetables per 3.5 ounce portion, providing 200 calories per serving. "White Fiber" pasta has three times the amount of fiber compared to the "Classic Blue Box" pasta with the same taste as regular pasta with 200 calories per serving. "Gluten Free" pasta contains 359 calories per serving and is made with rice and corn instead of wheat. Keep your pasta dish healthy by adding nutritious low-calorie selections. Opt for a tomato based pasta sauce or olive oil to add flavor, but avoid high calorie pasta sauces such as alfredo or cheese sauce. Add a lean protein such as grilled fish or chicken. Vegetables are low-calorie nutrient dense foods that add a lot of taste to your pasta dish. How Many Calories in Domino's Buffalo Wings Plain?